Tiger Bill reviews Peter Erskine Trio Live at Jazz Baltica from Hudson Music. Peter Erskine is recognized throughout the world as one of the most creative and expressive drummers playing in any style of music. His credits range from his early days with Stan Kenton to music as diverse as that of Weather Report, Chick Corea, Joni Mitchell, Michael Brecker and Steely Dan. 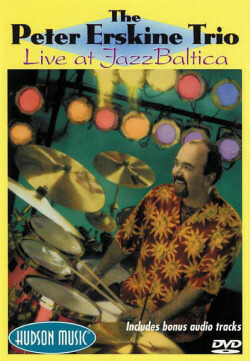 This DVD features the Peter Erskine Trio with pianist John Taylor and bassist Palle Danielsson recorded on a night in 1993 in Salzau, Germany. Whether you're an Erskine fan or not, if you're into jazz trios, give this DVD a listen. The playing all around is very tasteful and the arrangements are interesting.